Having two huge Peppa Pig fans in the house I was pretty sure that Jumping in Muddy Puddles Peppa Pig from Character Toys would be a success. As soon as I removed her from the box it was a battle as to who could be the first to touch her. whilst at the same time jumping up and down in muddy puddles! I thought this was a really clever idea and was surprised at how stable she was. I thought she may have tipped over but no, she remained upright every time she jumped. Peppa comes in her traditional red dress but is covered in muddy splashes from head to toe which have been very well replicated and do actually look like crusty dried on mud stains – something which 4 yr old Miss M was convinced were real!! 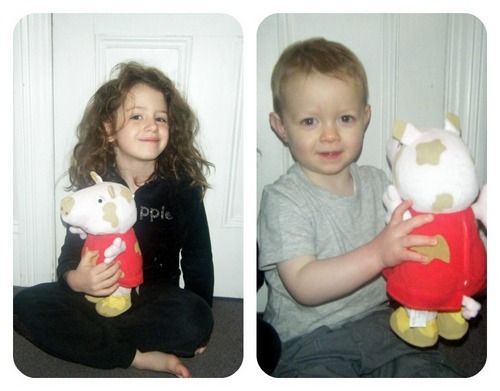 This Peppa toy is aimed and boys and girls aged 3-5 years although I would say that 2 yr old Mister B was absolutely fascinated by her and his first words on seeing Peppa in action were “I love it”. The fact that Peppa can also count up to 10 is a really helpful way for toddlers to improve their numeracy skills and Mister B copied Peppa straight away repeating 1 to 10 after her which is great as this will help him master his numbers in a fun, enjoyable way. He also loved jumping up and down alongside Peppa. Although her feet are solid the rest of Peppa is plush and Miss M insisted on taking her to bed for a cuddle. 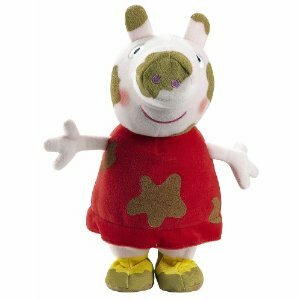 I think the Jumping in Muddy Puddles Peppa is a fantastic toy encompassing a plush and interactive play. Both my children enjoyed listening to Peppa chatter away and either copied her, laughed with her or made their own fun up around what she was saying. This would be a perfect Peppa toy for any young Peppa Pig fan and is sure to keep them entertained whether jumping around chattering with her or snuggled up in bed with her. This entry was posted in Reviews and tagged counting to 10, Jumping in Muddy Puddles Peppa, muddy puddles, Peppa Pig, review by Fiona Martin. Bookmark the permalink.